Skcin are delighted to announce that Story FMR (Funding Melanoma Research) are supporting our MASCED Accreditation Programme. The Melanoma charity was set up 2017 and established with a two-fold aim – Prevention and Cure. Run by a team of dedicated volunteers the charity’s key objectives are to promote and preserve the health of the general public by raising awareness of all areas relating to skin cancer including its risks, prevention and treatment, as well as supporting research into skin cancers including melanoma, its treatment and cure and to publish the useful results of such research. Story FMR has experienced amazing success with its first year of fundraising activities and in recognition of the valuable work Skcin are achieving in the field of awareness and prevention are kindly supporting Skcin to ensure the MASCED programme continues to grow, thrive and ultimately save lives. 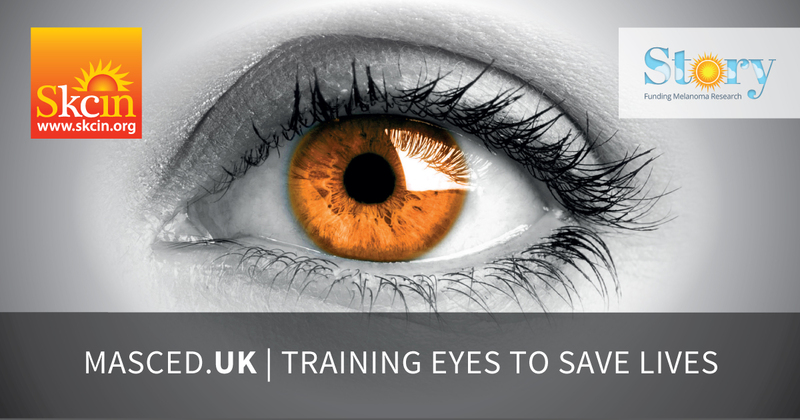 The MASCED Accreditation programme was designed and developed by Skcin earlier this year to train hair, health and beauty industry professionals in skin surveillance and the detection of suspicious legions. The objective of the accreditation is to raise awarness of the early signs and symptoms of the most common and fastest rising cancer and promote early detection of melanoma, to improve prognosis and saves lives. In addition the programme raises awareness of the importance of Sun Safety to aid the prevention of around 86% of melanoma and the majority of all skin cancer cases. This supports the call by public health figures for a wider perspective on who is most effective to help improve the nation’s health and address concerns raised in the Government’s 2020 Skin Cancer Vision. The programme has been a phenomenal success with over 7,000 registered professionals trained or in-training, within our first 8 months and 98% of users providing us with 5 star reviews. The Accreditation has been approved by dermatologists is now endorsed by professional bodies BABTAC (British Association of Beauty Therapists and Cosmetology) and HABIA (Hair & Beauty Industry Authority) and awarded CPD points. The training has also received the attention of the medical world with a comprehensive article soon to be featured in the Dermatological Nursing Journal, highlighting the programme’s success and accolades from the nursing community. The uptake in registrations is still growing and whilst the charity continues to work tirelessly to deliver and maintain the service to its users, we are truly grateful for the support provided by Story FMR. Marie Tudor, of Skcin said, “The MASCED training has been an overwhelming success, far exceeding our expectations. We are delighted how we have been able to harness the power of industry professionals via a targeted audience to help deliver our educational training, spreading the message across many industry sectors and filter this out to a wide public audience. The support of Story FMR is key to its ongoing success and development. Our objectives are aligned in relation to awareness and education and their sponsorship makes perfect sense. Story FMR are a new charity with the same values and ethos as Skcin and their commitment and dedication are evident by their growth and success with fundraising in such a short space if time. Skcin would like to thank Story FMR for their support and we hope to work further together to grow this relationship, educate our nation and save lives”. Melanoma and non-melanoma skin cancer Charity set up in 2006 in memory of Karen Clifford. Dedicated for over 12 years to the prevention and early detection of all types of skin cancer through educational intervention via their bespoke, diverse and pioneering national accreditation campaigns. · Melanoma is now one of the biggest cancer killers in 15-34 year olds. · Disproportionate numbers of younger people are affected. · Advanced melanoma is very difficult to treat. · In 2016 13,000 new cases of non-melanoma skin cancers were diagnosed in the UK. · In 2016 over 2,000 people died of melanoma. Claire Adams is MASCED Accredited! lynsey white is MASCED Accredited! Chris Surridge is MASCED Accredited! Wendy Doney is MASCED Accredited! Susan Stretton is MASCED Accredited! Samantha Rosson is MASCED Accredited! Christina Collins is MASCED Accredited!